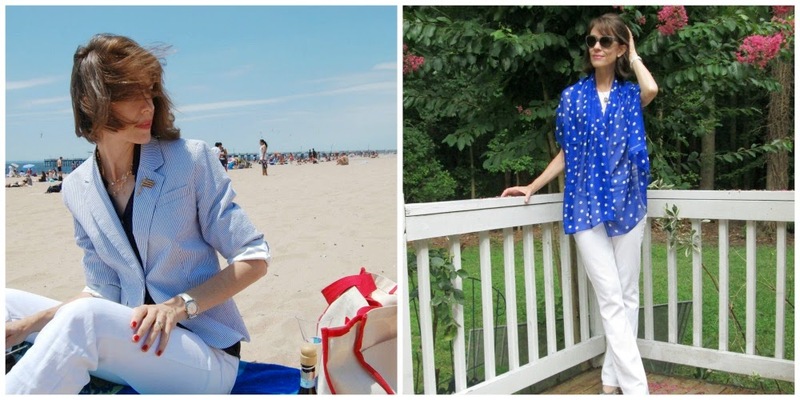 With the unofficial start of summer just around the corner, Adrienne of The Rich Life (on a budget) and I thought this was the perfect time to devote a “How I Wear My” post to a staple of so many wardrobes this time of year—white jeans. This was a fun post to put together because of the sheer range of jeans options shown—flare, cropped, distressed, straight, skinny. As you will see, white jeans play well with whatever you want to pair them with so I am certain you are going to find several looks here to love. Enjoy! What a perfect spring outfit on Adrienne, so feminine and wonderful, and I especially love the addition of that cheerful and chic yellow Adora bag named after her. Wow! Pre-orders are still being taken until May 12, 2015 if you want one too! This is definitely my new favorite picture of Helen. She looks so dreamy and ethereal in this gorgeous and Pin-worthy look! Deja has us all California dreamin’ with this look featuring white jeans. This is one of my favorite pictures of her! 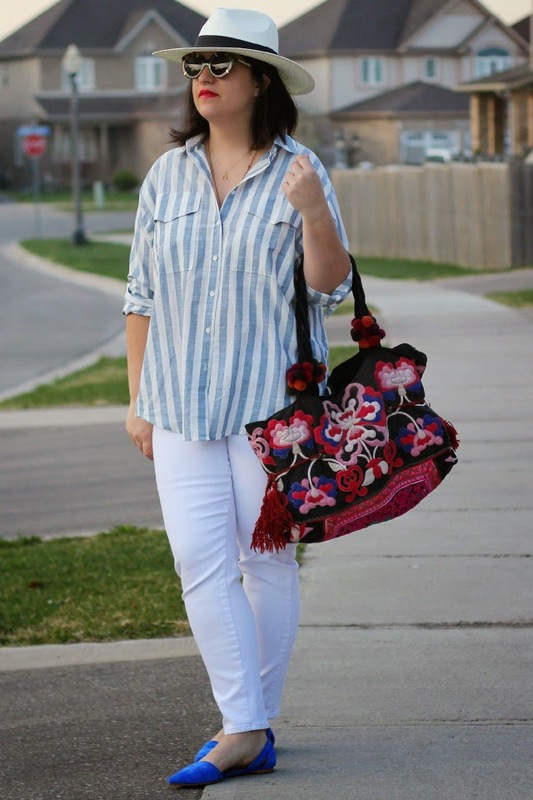 I can’t imagine doing a roundup post on white jeans without Nora. She always makes them look so fresh and fantastic. When I’m thinking of how to style a pair of white jeans, Nora is one of my inspirations and this look is exactly why! I really love this tone-on-tone look on Yvonne, especially how it’s taken up a few notches with the addition of the bright pumps. And the expression on her face makes me laugh. She looks like she just came from, or is about to go to, my kind of party! Jess of Elegantly Dressed & Stylish. Jess of Elegantly Dressed & Stylish joins us wearing white skinny jeans from Loft, which she paired with a lacy Sheinside top, pink earrings from Charming Charlie, and a gorgeous Balenciaga bag. I love the vibe of this outfit, with its feminine lace and edgy Balenciaga City bag, don’t you? 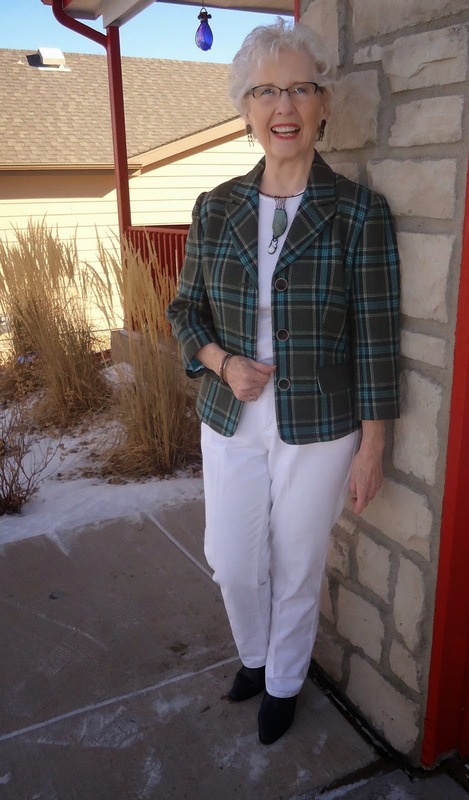 Cynthia of My Rose Colored Shades says a pair of white jeans has quickly become a spring staple for her. What a great pairing with a pale pink eyelet top, caramel colored bag, and rose gold flats, a seriously cool pair of shoes! Please head over to Redbook to vote for our friend Cynthia, who was chosen as one of the 25 finalists for the REDBOOK Real Women Style Awards 2015! Woo hoo! Scroll down until you see her picture, click on it, then click again when you see the heart to submit your vote. You can vote once a day until May 22! Vote here! 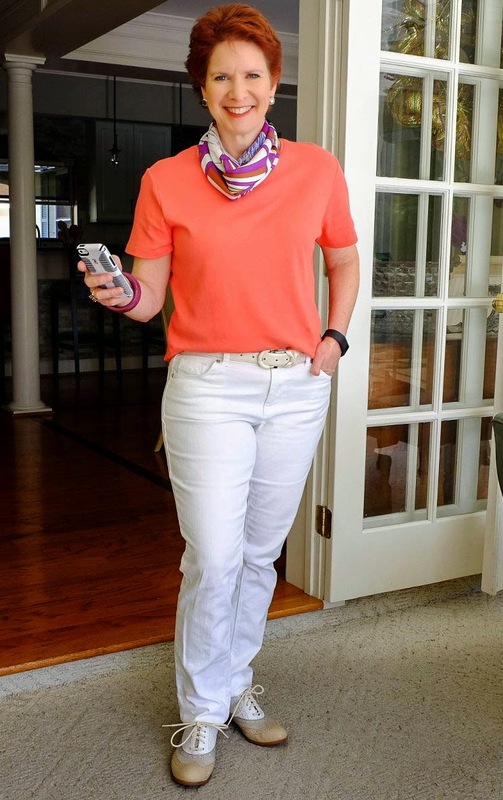 I love this rakish and colorful ensemble on Suzanne, especially paired with what she calls “attitude borrowed from 1980s Madonna.” That’s what I’m talkin’ about! Our resident Mix Master, as I affectionately refer to Alice, has mixed textures this time with the top and the sweater worn with her white jeans. I love the addition of the silvery loafers because I am still feeling the metallics and expect I am not alone in this. I think we will be seeing them again all summer. Our new friend BC wears her white jeans with a coral colored top, a wonderful scarf at her neck (all you H fans out there, you know who you are, is this H? And if so, what pattern?) and what I especially love, are oxfords in three colors, white, gray, and taupe. This is a terrific springtime look! I think this outfit on Susan is so perfect for Paris—or New York, London or Rome for that matter. Black and white always works! Susan is in France right now and I bet she is having a wonderful time! I always love navy with white, as well as T-strap shoes (one of my favorite styles) so I am a big fan of Ana’s ensemble! Charlotte, mother of Jodie of Jodie’s Touch of Style. 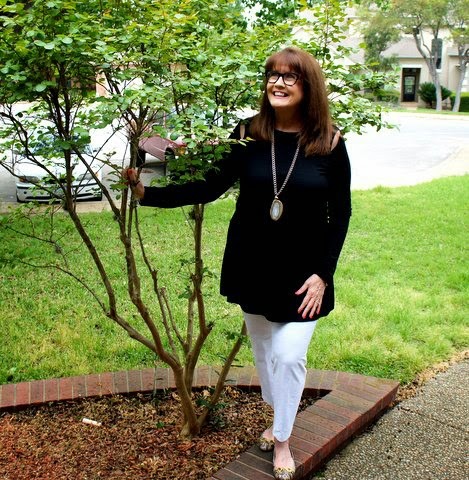 Jodie of Jodie’s Touch of Style says, “This is Charlotte, my mother & 70s model on my blog. I styled her with an all-white background to show off the blazer and artsy necklace. White jeans are truly my go-to because they look so clean! I’m still working on getting my mom to accept the fact it’s perfect to wear them every season! I completely understand how Charlotte feels, I still have a hard time wearing white jeans in winter. I like the unexpected touch of plaid with a pair of white jeans as Charlotte has worn them here! Bethany of Long. Leggy. Lovin’ It! Lucky Bethany for getting to wear her new white jeans in France. J’adore! Anyone who knows me knows champagne is my preferred drink so I especially like the look Bethany wears on the left, with the blue tunic as she stands close to the Veuve Clicquot RV! Oui (or is that whee?)! 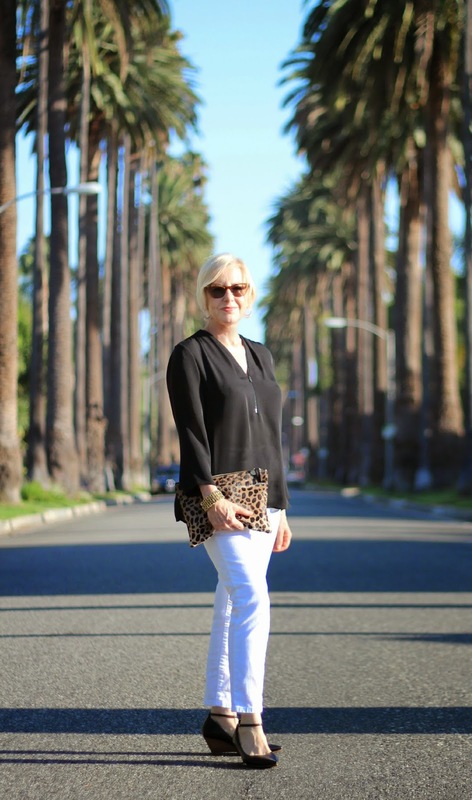 Pam of Over 50 Feeling 40 is wearing Eileen Fisher white ankle pants and a tunic from Marie Hell (God do I love that name and are those shoulder splits I spy?). The necklace is from Chico’s and the snakeprint shoes are from C. Wonder (and I would LOVE to know what Tory Burch thinks of flats her ex-husband designed!). I never get tired of black and white so I am so glad Pam sent in this picture. Doesn’t she look great? 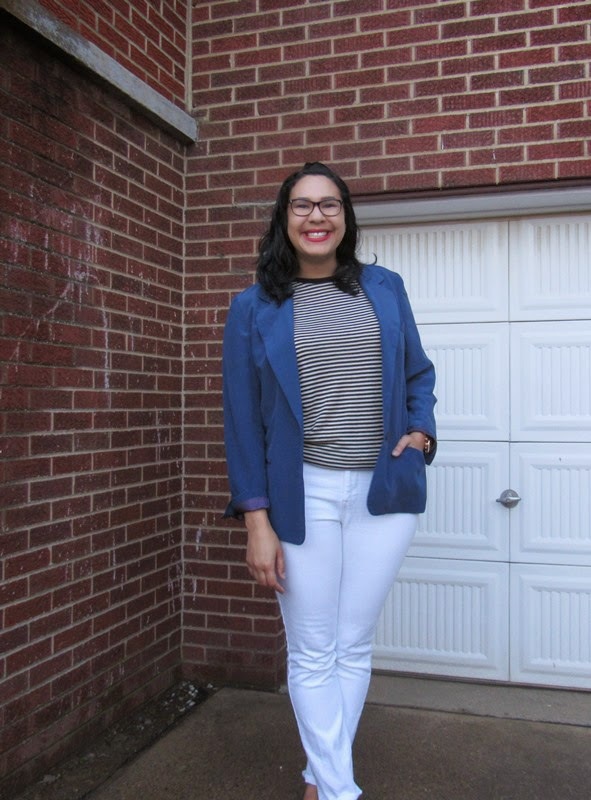 Gracey of Fashion For Giants is wearing jeans from Old Navy (the Sweetheart fit), the striped tee is Loft and she thrifted the blue blazer. I like the clean simplicity of Gracey’s white jeans look! 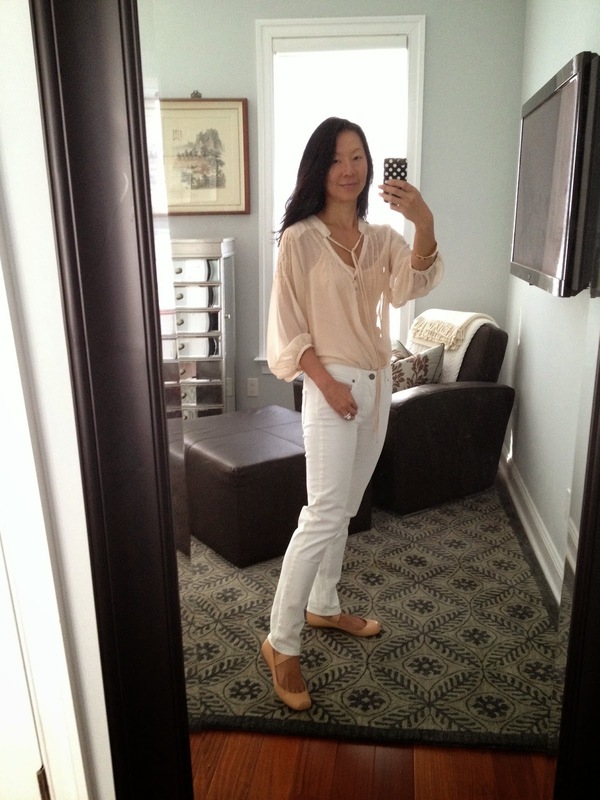 Jane of Toronto Shopoholic is looking like one cool customer ready to hop aboard a plane (or a yacht!) in this vacation-ready ensemble of white jeans with a vertical stripe blouse. I love the addition of the hat, round sunglasses, big colorful bag, bright red lip, and blue suede shoes. Elvis would approve and so do I! 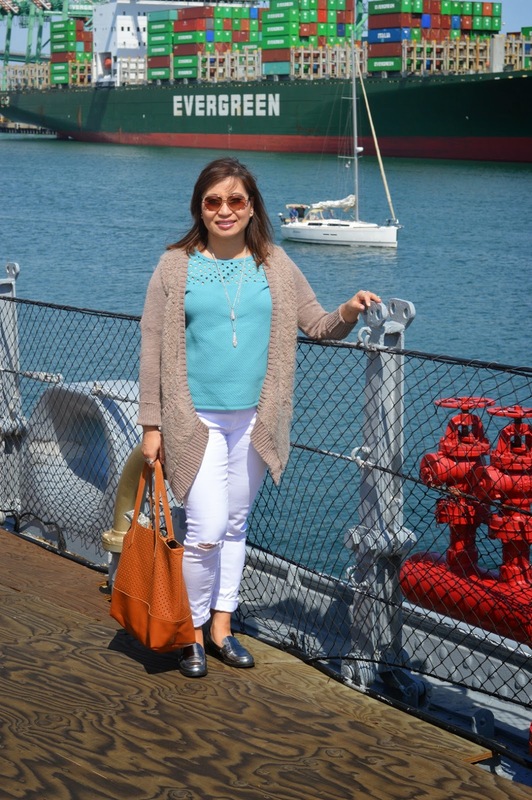 I love this denim-meets-nautical look on Trina, where the white jeans act as the perfect neutral between the two. I also loved that she punched up the outfit with the orange Sperry’s and a statement necklace in the same color! 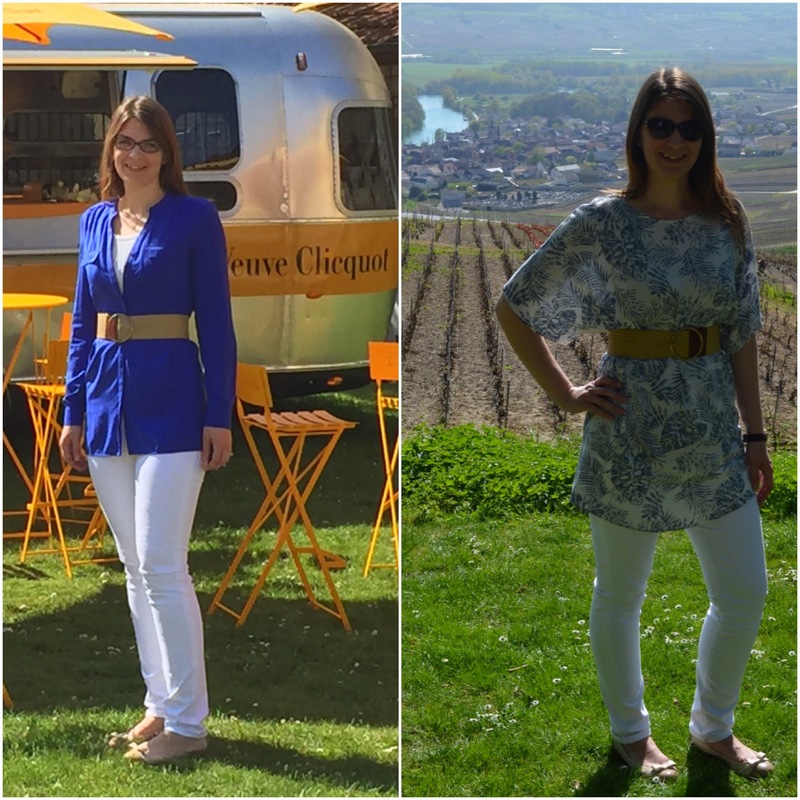 Two of my favorite ways to wear white jeans! This spring and summer I will be wearing my white jeans—these are from Old Navy, in the Rock Star fit—with my cropped Banana Republic seersucker blazer or my jewel blue polka dot silk chiffon scarf from Anne Touraine Paris! I always love to wear white jeans with a shade of blue and sometimes add in a pop of red. I am definitely going to be picking up a few more pairs of white jeans in different styles, like cropped or capri, after seeing all the great looks ladies submitted for this post. Old Navy and J. Crew, here I come! Rising temperatures may be upon us but we bet you’ve pulled a few jackets—in lighter fabrics and strictly worn during warmer months—out of the closet in anticipation of spring and summer, so join us in June for “How I Wear My: Spring Jacket.” Whether you like them striped or solid, in seersucker fabric or floral print, we would love to see how you style a lightweight jacket! Send photos to us at howiwearmy@yahoo.com by June 1, 2015 and please include a short description of what you are wearing. 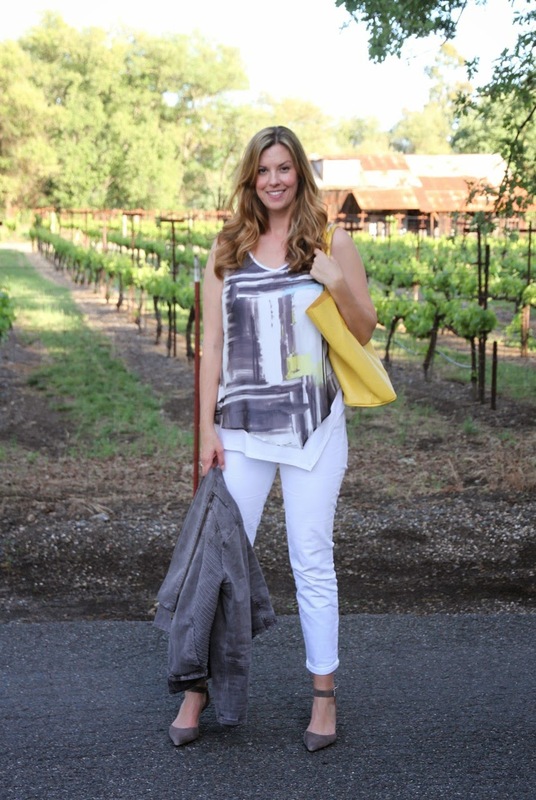 Do head over to Adrienne’s to see even more fantastic looks featuring white jeans. And THANK YOU to all the fine foxes who participated this month. We could not do it without you! I love your seersucker blazer with your white jeans, Jill. It's crisp and fresh, ready for spring and summet and beyond. The bright blue in your scarf really complements your hair and skin tone. Thank you for featuring my white jeans look (and everyone else's too, loved checking them out) and for your kind words. I'm loving all the layered looks, especially all the different blazers! The textured tops are very cool as well as the vertical striped shirt. That's what I love about white jeans, it allows everything else to be the star of the outfit. Everyone looks so fabulous! There's just something so fresh about white jeans. Thanks again for hosting, Jill! I love everyone's take on the white jeans. Your polka dot top, I love it! Fabulous white jeans looks! I am so glad we chose this as a theme. Everyone looks so fresh and so stylish in their outfits! Looking forward to Spring Jacket next month. Jill, your reminder of how brilliant white jeans paired with a birght blue is, was just the inspiration I needed today. Love both your looks, they are casual chic at its best! Thank you, once again for this fun monthly get together. Thank you so much for yet another fabulous "how I wear my" post Jill, and thanks for your wonderful intro and comment about my look! Everyone looks great as usual and I love your seersucker blazer and that blue top looks beautiful on you. Looking forward to next month's! Thanks Jill and Adrienne. Great HIWM this month. Was hoping to wear my new white jeans and black jacket in Paris... but we had rain and HAIL today, So not the weather for summer outfits! Ah well...it's Paris...how bad can it be? Thanks for including me, Jill! Since I just bought my first pair of white jeans last month, seeing how everyone else styles them is SO fun and helpful. I'm excited for the spring jacket theme! Blue and white are always so crisp together. They remind me of Boston and the Kennedy's. I'm loving white jeans lately...great assortment here but especially loving Yvonne's with orange pumps and great attitude. Jill, pic recent? Hair still looking fab but less Bobby...Maya ok with it? So many beautiful looks! I love the yellow bag with the grey/yellow white combo on you, so fresh!Thanks for featuring my look I have a pic on my blog on an added pink jacket for additional color to the all white look. Lovely looks to inspire! I am loving all these white jeans looks! Your seersucker blazer with the white jeans is perfection. Blue and white is one of the best color combos. Thank you so much for the shoutout. I really appreciate the support! Great looks here! I just started following 'How I Wear My' and it's great. As for my pic - yes, the scarf is Hermes in Spinnakers pattern. Hi BC! Woo-hoo, I figured the scarf was Hermes but I did not know the pattern. Thank you for sharing the name with us! It is gorgeous! We are big H fans here at EJS so you are more than welcome to join us with any H goodies you have for the next "How I Wear My." Thank you so much for joining us this month!